Estes Park, Colorado, is a place of serenity. But it wasn't always so serene. Shortly after the Civil War, Nathan Kendall and his wife were murdered there. The crime was never solved. Now...historian Scarlet Barlow is working at a small museum attached to a B and B, the same building where that murder occurred. When Scarlet unwittingly takes pictures of people who've been murdered - just like the Kendalls a hundred and fifty years before - the police look at her with suspicion. There were great twists to throw you off from solving the mystery and the crime. Loved every minute of this chapter in the Krewe of Hunters series. 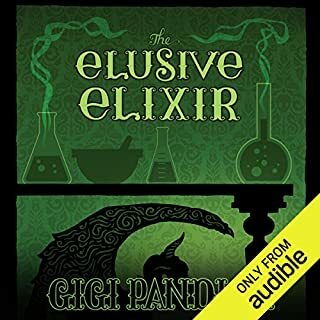 Phil Gigante is one of THE BEST narrators!!!! His many voices were good and stayed true to each character. 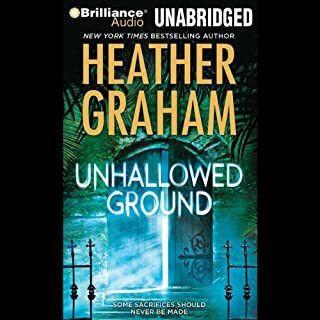 I hope he narrates many more of Heather Graham’s books. I rather enjoyed the references and historical mentions to Poe and his life. 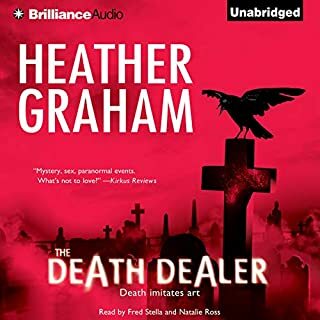 Heather Graham never ceases to write a good story. Charlene "Charlie" Moreau is back in St. Francisville, Louisiana, to work on a movie. One night she stumbles across the body of a Civil War reenactor, the second murdered in two days. Charlie is shocked to learn that her father - a guide on the Journey, a historic paddle wheeler that's sponsoring the reenactment - is a suspect. 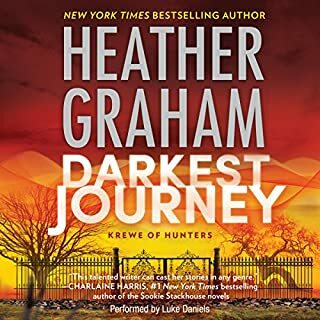 The sample on Audible did nothing to excite me to buy this audio book but I knew I had to get through it so I could move on in the series. I LOVE the Krewe series. Well, I was more than delighted I went for it. Great story!!! Great history intertwined!!! And the narrator really did do a great job. I was concerned at first by the sample he wasn't going to be able to offer different voices for the variety of characters, especially the females. He did an excellent job. 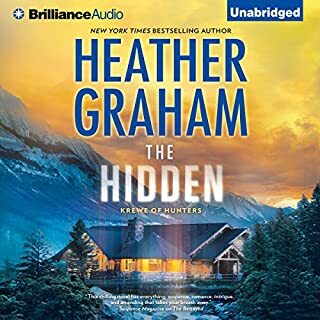 Heather Graham did not fail to deliver here another wonderful mystery/whodunit with characters who come to life in the telling of such a great story. She not only brings to life the characters but also the landscape all around. I always want to visit where she has so wittingly and wonderfully brought her story to life. Maybe one day I will be able to do just that! I look forward to each of the next in the series!!! Regina Delaney loves making children happy. Playing Dierdre Dinosaur for adoring audiences at the theme park she started with her twin brother Max gives the local kids - and Reggie - countless hours of innocent pleasure. But make-believe morphs into suspicion of murder when Max's ex-wife vanishes... and Max becomes the prime suspect. Reggie is determined to uncover the truth and clear her brother's name. So is Wesley Blake. 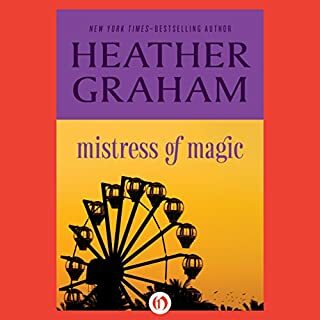 Two stars because Ms. Graham is one of my most favorite authors. You could fit the actual mystery into a third of this book. This is more so called 'romance' than mystery. The only 'intrigue' is in the why. The narrator is another 'why'. She had some redeeming moments but I would not have cast her for this particular book. Maybe try for a Cozy Mystery. Might be better suited to her style. Not a bad narrator, this was just not the style of book/story for her voice and vocal choices. This book should be listed as a Romance novel with a little intrigue woven in - very little. I was very caught up into each character and all the interactions between each character. I found myself rooting for different ones, upset with others and just felt as if i were there with all the characters and on each setting. I cannot wait to begin book 2!!!! 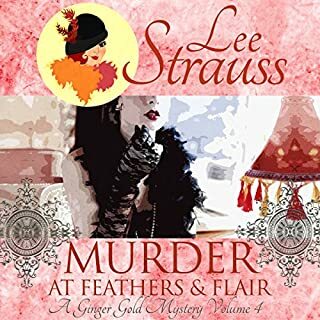 It's 1924, and war-widow fashionista Ginger Gold's new Regent Street dress shop, Feathers & Flair, is the talk of the London fashion district, attracting aristocrats from Paris to Berlin to Moscow. Ginger is offered her first job as a private detective when her sister-in-law's stage actor friend goes missing, and though the dress shop takes most of her time, Ginger takes the case. But when a Russian grand duchess dies at the shop's official grand opening event, Ginger ignores the missing person to chase a killer. It's a decision she will live to regret. 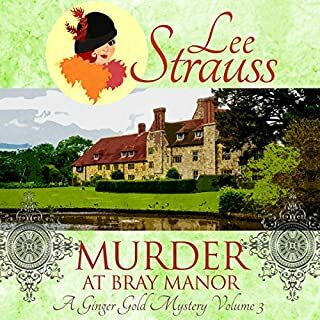 Ginger Gold receives a letter from her sister-in-law, Felicia, requesting Ginger come straightaway to her late husband's family home, Bray Manor. Dowager Lady Gold, Ginger's nervous grandmother through marriage, believes the old manor is haunted. Ginger doesn't believe in ghosts, but is haunted nevertheless by memories of her husband and the lure of his gravesite she just can't bring herself to visit. I love audiobooks as i can read even when driving. You never know if the narrator will be agreeable to deliver the story in such a way that you get drawn into each character which also helps bring the listener into the story. This narrator was Perfect!! Now I wish she had narrated the first two books as well. 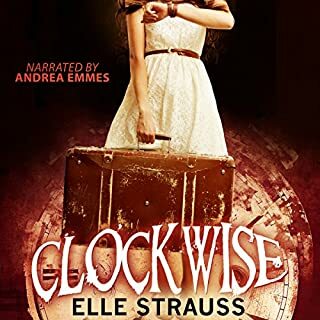 Ms. Strauss’s books are interesting and involved with good characters and fun twists. I can’t wait to read (and hopefully listen) to the next book in this series!! I would highly recommend the Ginger Gold series!!! The story never came to life due to the sing-song rhythmic pattern of the reader. And yes, it was ‘read’ not portrayed. I never really felt any of the characters come to life nor did she ever bring the story alive. 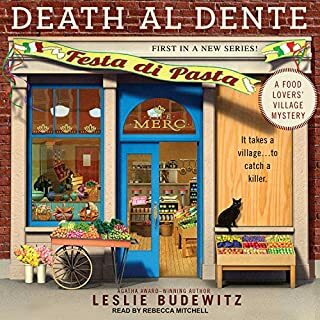 I enjoy Leslie Budewitz books but will think twice if read by Rebecca Mitchell. Buy the book and read it yourself. You will enjoy it far more. I am hoping there is book #4 ready. Great characters, storyline keeps me looking forward to the next. Gigi Pandian keep writing these and Julia Motyka please keep recording these characters!!! Only one request - I would LOVE to be able to try these fantastic recipes of Dorian's. Please include several at the end of each book. Or create a Dorian and Zoey cookbook - meat and meatless versions. Wow, the good sounds so wonderful in your books !! !